And she wasn’t kidding about the gnocchi. I ordered the Gnocchi alla Reggiana which is soft gnocchi pasta served with Italian sausage, fresh tomato and basil sauce (pictured below, $12.95 at lunch), and this was a real treat – the sauce had just the right amount of garlic and tomato and left me wanting more. 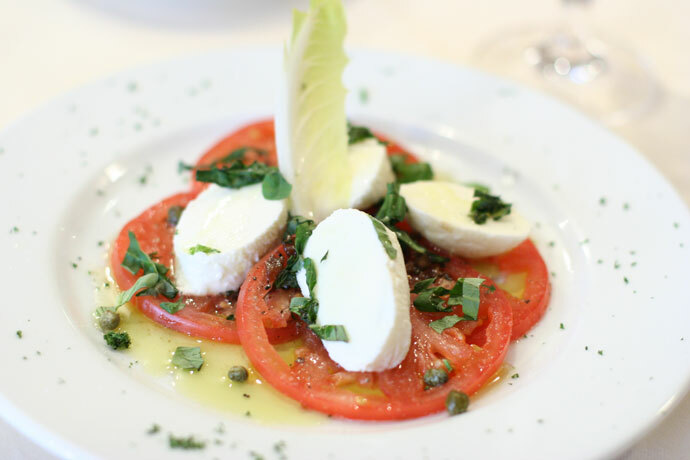 I also really enjoyed the Insalata alla Caprese, a salad made with Tomato, Bocconcini, and capers with fresh basil (also pictured below, $8.95 at lunch). Dinner prices are slightly more than lunch, around $16.95 for a pasta. 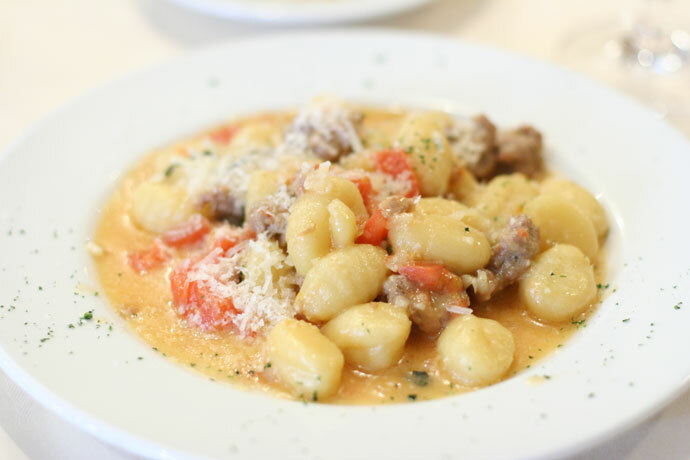 Gnocchi with Italian sausage served in a sauce made with fresh tomato, basil, and garlic. Tomato and Bocconcini salad with fresh basil. Delicious and refreshing! 27,609 views. This entry was posted on Friday, November 23rd, 2007 at 11:21 pm	and is filed under Casual, Comfort food, Dine Out Vancouver, Downtown, Favorites, Fine Dining, Food Photos, Home Cooked Style, Italian, Lunch, Lunch Specials, Mediterranean, Pasta, Reasonably Priced, Restaurant, Seafood, Soup, Tourist Attraction, Upscale, Vancouver, Vancouver Restaurants, Yaletown. You can follow any responses to this entry through the RSS 2.0 feed. You can leave a response, or trackback from your own site. Wine sediments may be an indication of quality. If the sediment was larger, a piece of cork could have fallen in. Sure they could have been nicer but what they did was fair. The comments you made regarding the sediments in the wine let me know, that only a psychiatrist can solve your problems.